The Fully touchscreen mirror dash camera. With the dash cam market becoming increasingly saturated with generic imitations and uninspiring designs, a gap has opened for something fresh and innovative. 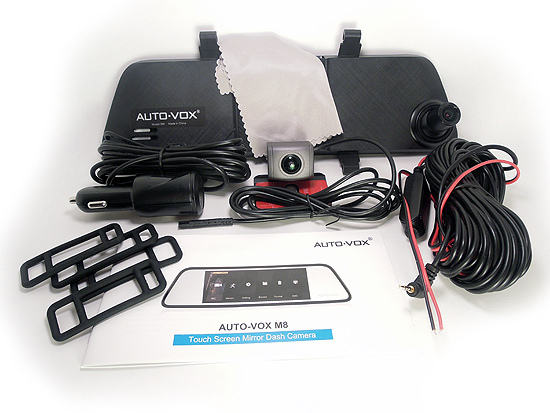 This is where AUTO-VOX’s M8 dash cam comes in. Sporting a unique mirror design, touch screen interface and a variety of features, the M8 is a considerable choice in it’s price range. Open up the box and you’re greeted with the usual set of accessories. This includes the necessary cables to get the M8 working, some mounts, literature, a cleaning cloth and a lithium-ion battery. You’ll also find the rear camera along with the LCD display that will be replacing your vehicle’s mirror. Speaking of which, the display unit is definitely an interesting design. It looks just like the mirror you’ll be hooking it onto, just a little wider so that the camera at the back can peek through. Two solid mounts and a charging cable is all it takes to get it connected. Sitting dead center at the front of the mirror is the 6.8 inch LCD display, similar in size and resolution to those found on Android tablets. This will act as a live feed of what the camera on the other side of the mirror is recording, as well as being a user interface. Now it would only be natural to wonder how you’ll see what’s behind you if there’s a big screen covering your mirror. Luckily AUTO-VOX has thought of this and included a second camera that sits at the rear, which will feed the footage it records to the display up front if you choose to do so. 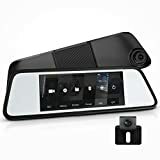 The idea is to place the rear camera above your license plate, providing a clear and comprehensive enough view for you to put your vehicle in reverse without fear of knocking someone over. This makes sense as its where most vehicle manufacturers place rear-view cameras in modern cars anyway. Overall, the M8’s design is not only unique, but very intuitive. It provides a smart solution to a problem that would otherwise make the setup do more harm to you than good. It may take some getting used to, but the added safety benefits of having front and back surveillance of your vehicle could save you thousands in the long run. Going back to the camera attached to the mirror, it is capable of recording 1080p video and features night vision, providing a clear and smooth image 24 hours per day. With a 6-glass lens and smart image processing, it does a good job capturing small but essential details such as license plates and badges at long distances. The rear camera is no slouch either. A standout feature is the 180-degree wide angle lens, which helps provide that comprehensive view you need when reversing. Its also IP68 water resistant, which allows you to drive in the rain without worrying about the rear camera kicking out. There’s also an overlay that provides a digital guideline to aid in maneuvering in and out of tight parking spaces. There are numerous other safety features built-in as well, such as lane departure warning, which will automatically play an audible sound when you veer off into other lanes. 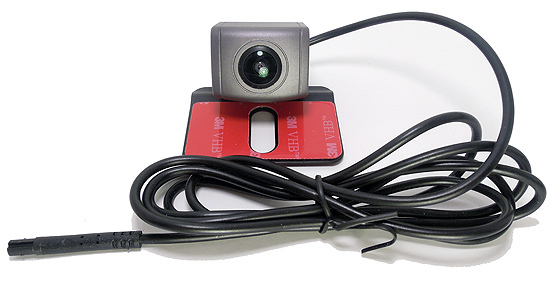 The motion detection software works for anything within 9 feet of your vehicle, switching the camera to your vehicle’s battery power to continue recording any incidents it picks up. The display is bright, pixel-dense and large enough to act as a sufficient replacement for the mirror behind it. It also provides a variety of functions that a normal mirror can’t. The standard overlay shows the device’s storage usage, recording time, battery life, date and time, microphone status and numerous other tidbits of information that help you get a better idea of what’s going on. If you’re not into any of that, you can have the display power off completely while the cameras keep rolling. Oh, and its also a touch screen. 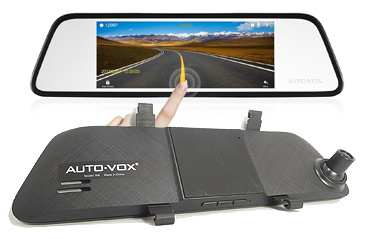 One thing worth noting is that the display and camera unit may be a bit too much for some mirrors to handle, which is why AUTO-VOX recommends you have an additional mount attached to keep things stable. Another caveat is the lack of an included microSD card for storage. Be sure to pick a fast and sizeable card to keep things going smoothly for longer. If you’re worried about having to constantly transfer recordings off your SD card due it running out of space, there is a loop recording function built into the M8, which will automatically delete old footage based on the time frame you choose to allocate. There aren’t any mobile apps or programs for editing, sharing or transferring videos, so you’ll have to copy your files onto another device and go from there. This shouldn’t be much of an issue though and can be completed avoided by making use of the menu found on the touch screen display.